As we all know, Iberian ham is a food that's been classified as the star of Spanish cuisine. However, many ignore the fact that even after it's finished, we can continue to enjoy its delicious flavour, getting the most out of it and enjoying different culinary options. We can achieve all of this with just one thing that's left over after we've finished the ham: its bone, which we shouldn't throw away if we want to spice up our cooking and the dishes we prepare. 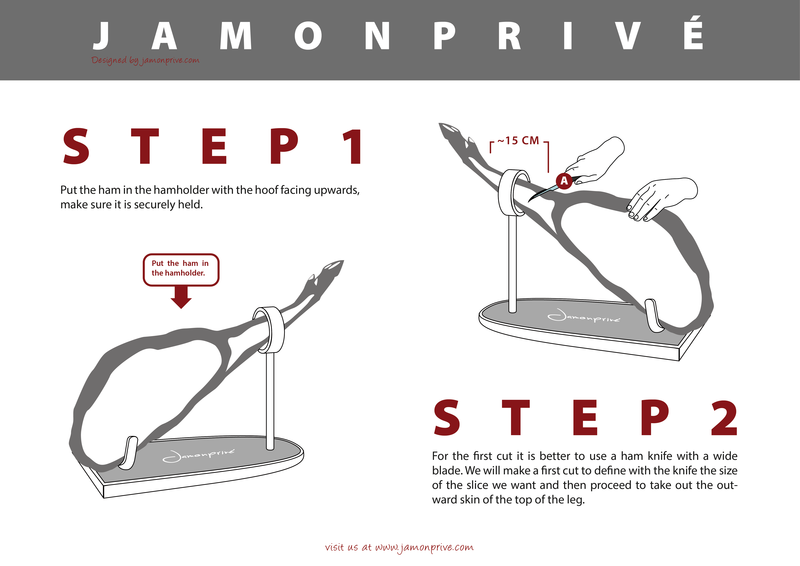 Here we're going to be sharing different ideas that you can use to take advantage of the ham's bone, the last remaining part of the investment we made when buying it. These are delicious recipes that'll leave a good taste in your mouth and will use up every last bit of our ham, no matter what type it is: black-skinned, Iberian, Serrano, etc. First things first, how do we handle the ham bone? 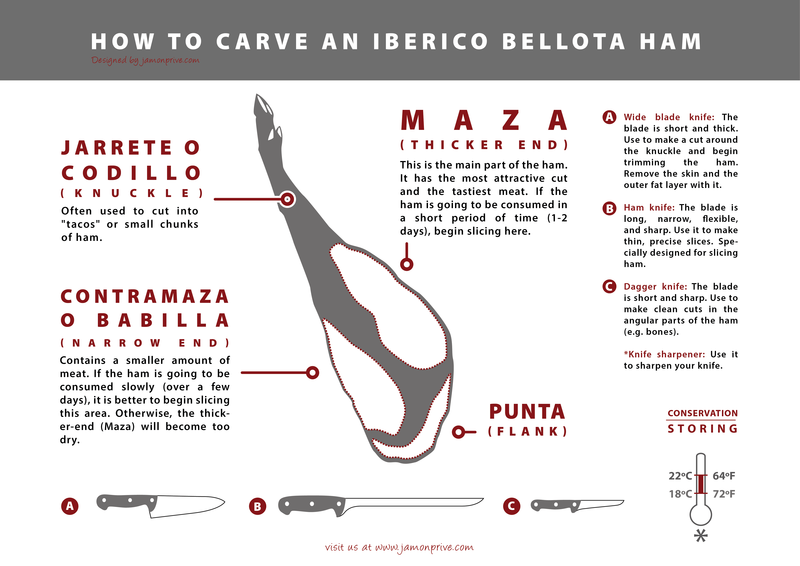 We recommend cutting the bone into small pieces or slices, making sure that there are no sharp edges. The tools we primarily need are a good table and a powerful saw; otherwise, we can take it to our trusted butcher so that they can do us the favour of cutting it for us, as they'll have the right tools for this procedure. 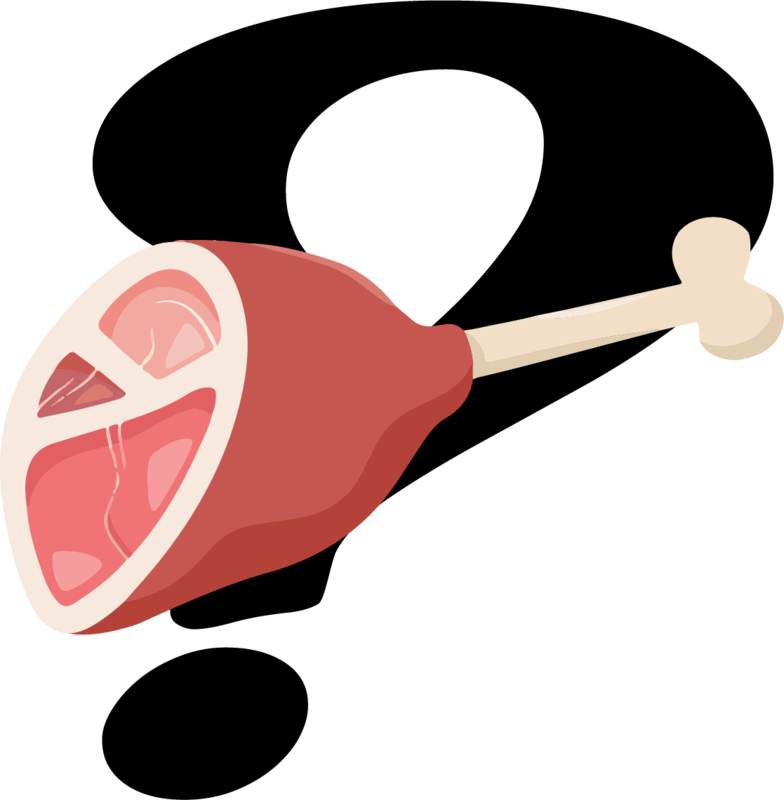 When we've got the ham bone in pieces, we can either use it immediately to prepare a dish, or we can store it in the freezer to use it at a later date. We must keep in mind that if we are going to freeze the bone, we should cover it with film paper or in a vacuum freezer bag to prevent it from drying out. Now let's get to the point - here are a few different recipes that can be prepared using the bone. This is one of the main uses for the ham bone. It is a delicious broth with a slight taste of ham. In addition, it doesn't take a lot of work and can even be prepared by those who are unexperienced in the kitchen. 3 ham bones, preferably Iberian ham. Bleach the bones: we'll leave the pieces of bone soaking in hot water until it boils; we'll notice how it begins to release impurities that can harm and damage the flavour. We should repeat this process 2 to 3 times. Cook the bones: we proceed to cook the pieces of bone for about two hours. To do so, we add 2.5 litres of water to the pot and remove the fat that is gradually released from the pieces of bone. Strain the broth: we then have to strain the broth to make sure we filter all possible impurities that may be left over. Now we can consume it directly or store it in the freezer for later consumption, or use it to prepare other dishes. One alternative is to make ham gelatin. All we need to do is put water in a pot with the bone and wait for the water to boil for the correct amount of time until it turns into gelatin. This can be used to give other traditional dishes a special touch. To prepare this delicious dish, we will need to use the broth that we learned how to cook previously. 450 ml of ham broth. 200 g of Iberian ham..
Flour, eggs and bread crumbs. Sauté: first sauté the onion and ham in a little butter, adding the flour later on to then continue softening the ingredients for a little longer. Then we add the ham broth and the milk until they are integrated, while we continue to heat it up until it begins to form a dough. Cook the dough: we proceed to cook the dough for about 10 minutes on a medium-low heat while stirring. Halfway through the process, we add a pinch of nutmeg or any other seasoning of our liking. Let the dough rest: once we have finished, we pour the mixture into a container and cover it with film paper and keep it in the fridge until the next day. Shape the croquettes: now that the mixture has been able to rest in the fridge, it is time to shape the croquettes. We prepare elongated strips of the desired thickness on a surface with flour, then cut them and coat them with a mixture of egg and bread crumbs. Fry the croquettes: all that's left to do is fry the croquettes. To do so, we will use enough oil to cover them entirely. We must make sure the oil is very hot, otherwise they may break and won't achieve the desired appearance. In this recipe, we will also take advantage of the same bones we used to make the broth. 3 ham bones, preferably Iberian. 2 - 3 large potatoes. Boil the water, bones and vegetables: the first thing to do is put water, bones and vegetables in a pot until they boil. Then we lower the heat and let it cook for about an hour; we will remove the foam and the fat that is released. Straight the broth: strain the broth and add salt to taste. Make the soup: now we just have to add the noodles or any other type of pasta of our choice, accompanying it with a hard-boiled egg and cooking it for a few minutes. So there you have it. All that's left to do is to try these recipes we've presented and even experiment with other cooking ideas that you may think of. After all, there's no doubt that the characteristics and flavour of the ham is practically a fool-proof guarantee for a delicious dish. Use it to whip up a fantastic meal to share with your loved ones.